The 3rd Annual Afro Punk Music and Film Festival kicks off June 28th – July 7th with a very eye opening and stirring in person discussion with legendary Black Panther Co-Founder Bobby Seale. A discussion about the movement and the history- where it’s been and where it’s going. Throughout these 10 days of programming will be everything from workshops, to film screenings, live performances, a block party, and huge outdoor concert which will take place at the Brooklyn Museum. The 3 main venues that are housing this spectacular curation are BAMCafe, The Brooklyn Museum and Southpaw. 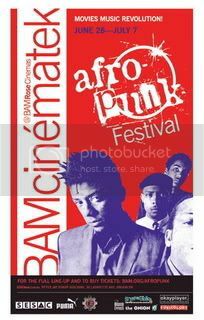 The Afro-Punk Music and Film Festival is co-founded by Matthew Morgan and James Spooner. Matthew Morgan is executive producer. James Spooner is the director of Afro-Punk the documentary and also his new film ‘White Lies, Black Sheep’ which will be test screened during the festival. The purpose for this festival is to nurture and celebrate the diversity of the “Other Black Experience”. The change and growth of this movement and to bring music and films that inspire and educate to a much larger and more excited audience than ever. Next Post Q-Tip - New Single, Free Download!